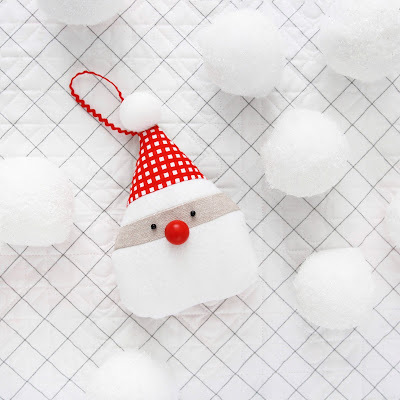 I did a tutorial for the snow-capped trees that you can find HERE, but keep reading below if you want to Christmas-fy (that's a real word, right??) your camper too! The printable templates for the wreath are at the very end of this post! 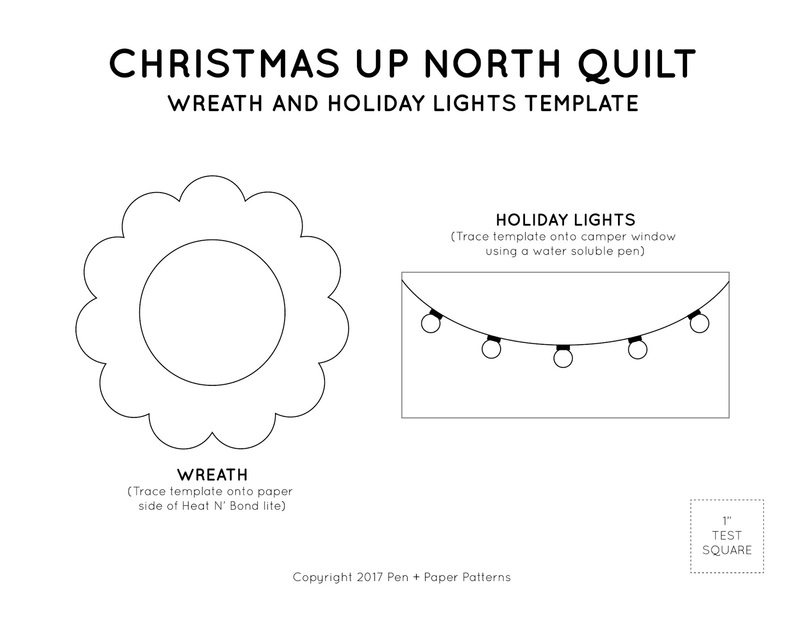 To make the wreath you'll need a 4 1/2" square of both Heat N' Bond Lite (my favorite interfacing for applique) and green fabric. 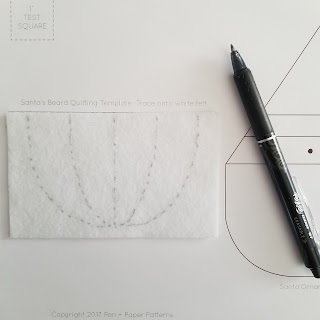 Print the template below at 100% or "Do Not Scale" and trace the wreath shape with a pen or marker onto the paper side of the Heat N' Bond Lite. I find I'm able to see the shape of wreath perfectly through the Heat N' Bond without using a light source, but if you're struggling to see the wreath shape through the Heat N' Bond I recommend holding them up to a light source instead (a well-lit window is perfect!) and then tracing it. Following the directions on the Heat N' Bond package, adhere the interfacing to the wrong side of the green fabric. 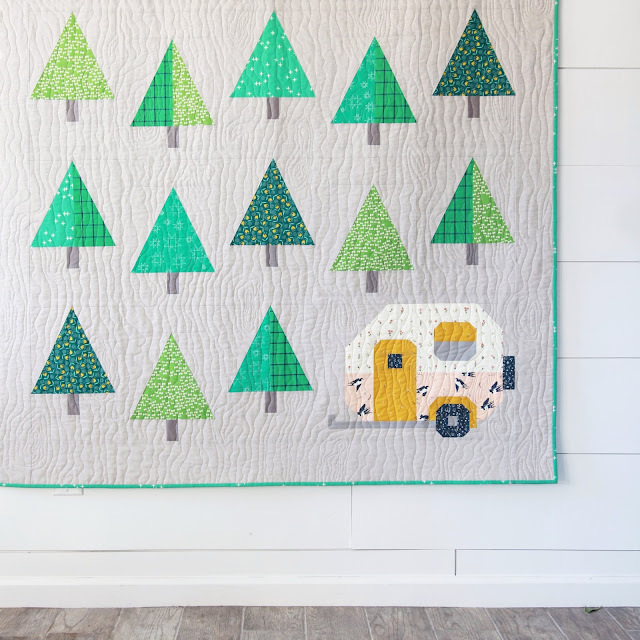 Cut out the wreath shape from the interfaced green fabric and then, with a hot, dry iron, adhere it to your camper block. I used a blanket stitch to applique my wreath to the block, but a zig-zag or straight stitch works too! Embellish your wreath as desired. I kept mine plain and only added a little red bow after it was quilted, but you could have so much fun adding details to yours! To embroider the lights onto the camper window, you'll want to position the template underneath the camper block window (this time you'll definitely want to use a light source to trace it) and with a water soluble pen, trace the lights onto the window. I did not use any stabilizer when I embroidered mine, but you might find it necessary when you are doing yours. Using a straight stitch, I first embroidered the strand and did a quick satin stitch for the top of the lights as I got to them (hope that makes sense!). 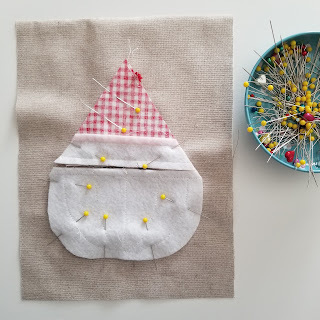 I used a satin stitch for the bulbs as well in a red and green embroidery floss. Oh and speaking of embroidery floss, I just used 3 strands of a DMC thread for all parts of the holiday lights. Hope all of that ☝ makes sense! Comment below or email me at PenAndPaperPatterns@gmail.com if you have any questions! When Love Patchwork & Quilting approached me about contributing to their Quilty Advent Calendar series I immediately knew what holiday-themed project I wanted to do and if you've been following me for awhile it might look familiar...A few years ago, when I was working at a local craft/fabric store (RIP Scrapbooks Etc 😢), I was asked to make some projects for their holiday display and the Santa Ornament was one of them! Still one of my favorite Christmas projects that I've made and one I've been meaning to put online for a while now. This was the perfect opportunity to finally do it! 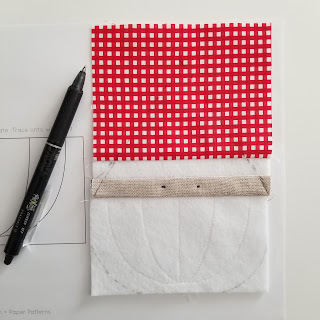 I've written step-by-step instructions below that include visuals AND if you scroll to the very, very bottom you'll find a condensed printable version of the pattern with the templates too! 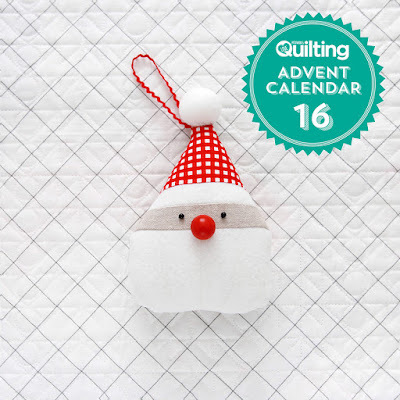 (There might be a fun surprise down there also 😉) And make sure to check out the other projects and giveaways happening during the Quilty Advent Calendar series on Love Patchwork and Quilting's blog! So many great projects and prizes have been shared so far! 1. Using the Santa’s Beard Quilting Template printed at 100% or "Do Not Scale", a water-soluble pen (I am using a Frixion pen) and a light source, trace the quilting design onto the 3” x 5” piece of white felt. Hand or machine sew the design onto the felt. 2. 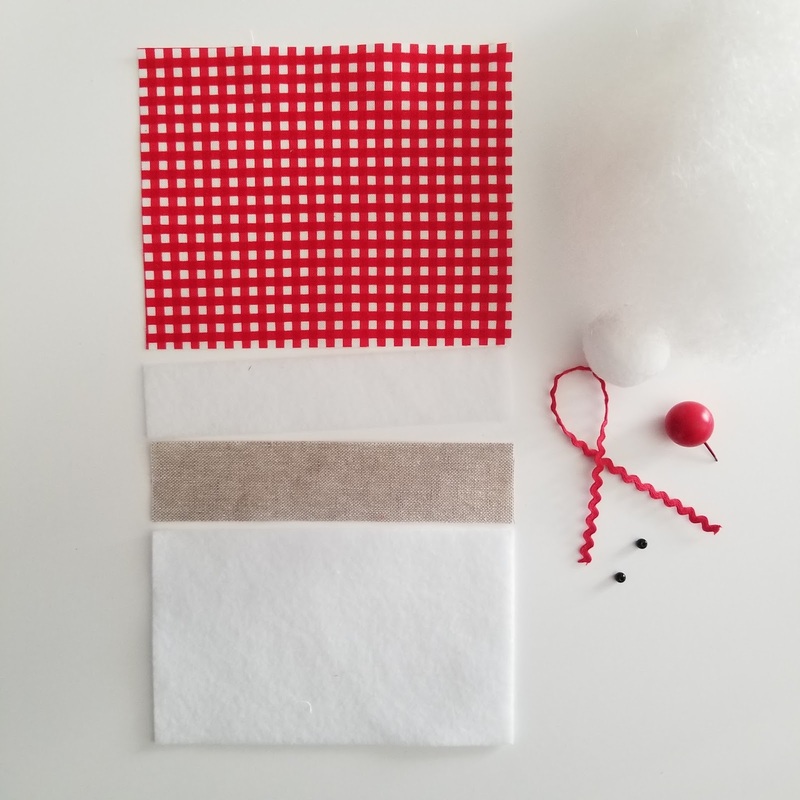 With a 1/4” seam allowance, piece the front of the ornament together in this order (from top to bottom): 4" x 5” piece of fabric, 1” x 5” piece of white felt, 1 1/8” x 5” strip of linen and 3” x 5” rectangle of white felt. After it is pieced the front of the ornament should measure 5” x 6 1/2”. 3. 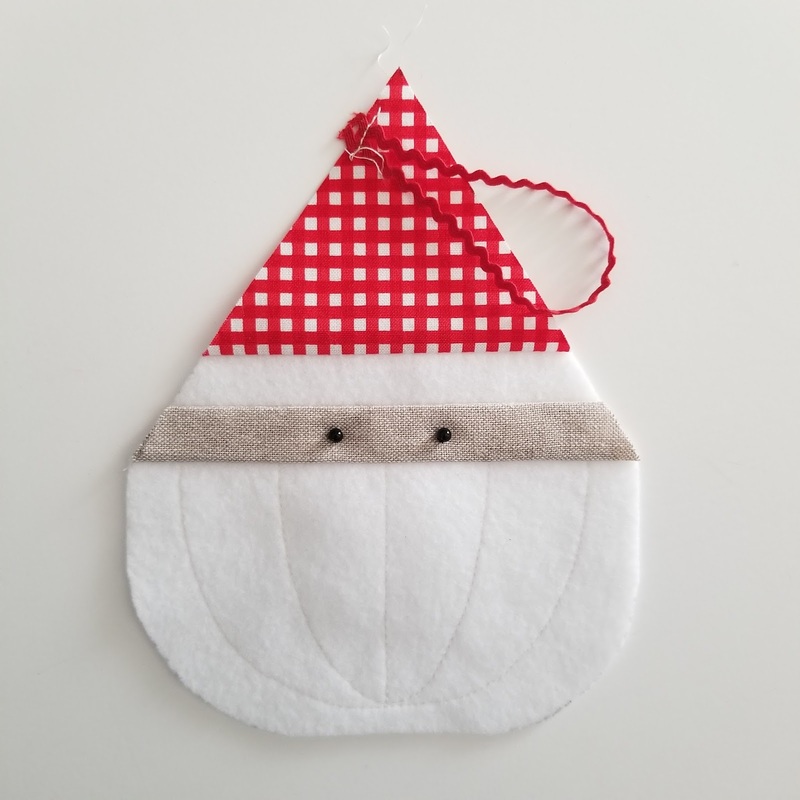 With a water soluable pen and the Santa Ornament Template, trace the outline of the Santa ornament onto the pieced ornament front. Make sure to mark the placement of the eyes too. Cut out along the marked edge. 4. Hand sew the eyes on with black thread. I recommend sewing the bead on with two strands of thread and loop it through several times. The beads can become loose when you're turning the ornament right side out, so it is important to make the beads as secure as possible. Loop the two raw ends of the ricrac together, and with a basting stitch, attach the raw ends to the top of the ornament. 5. With the front of the ornament and backing right sides together, stitch around the perimeter of the ornament using a 1/4“ seam allowance. 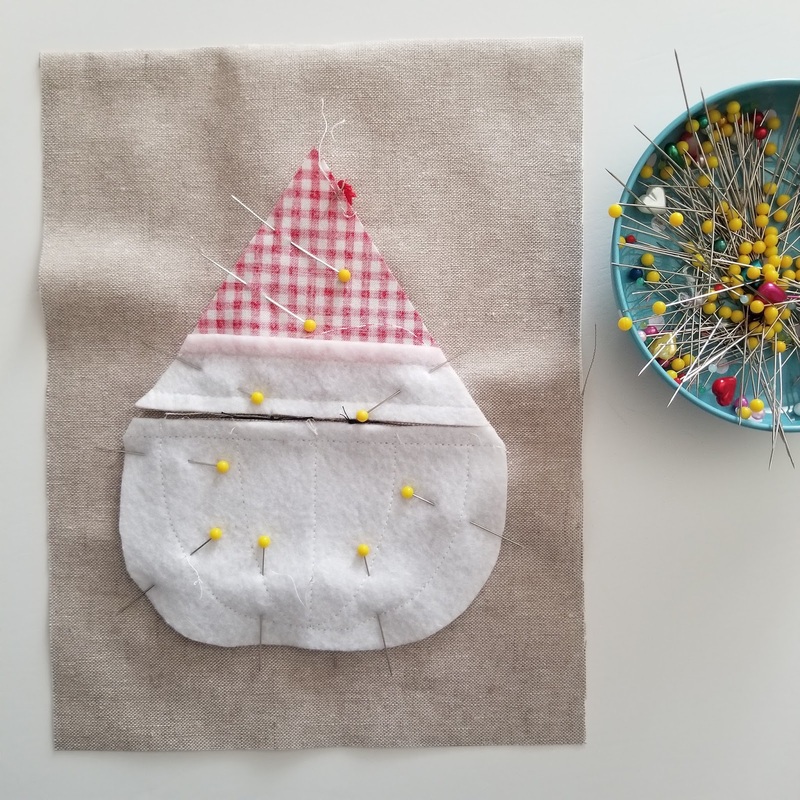 Make sure the ricrac is tucked in between the backing and front of the ornament, but out of the way when you're sewing these two pieces together. 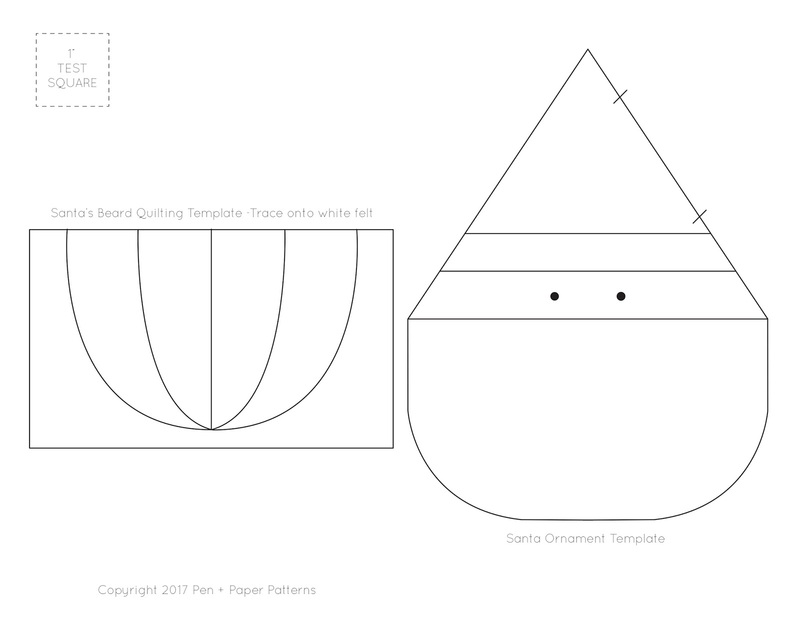 Leave a 2-3” gap along one side of Santa’s hat for turning right side out later. Trim off the point on Santa's hat to reduce bulk making sure not to cut through the stitches. 6. Turn the ornament right side out, stuff with batting, and hand stitch the opening closed. Using hot glue, attach the white pom-pom at the top of Santa’s hat and the red nose centered just below his eyes. Hope you enjoy making this ornament! Please tag me (@penandpaperpatterns on IG) if you post about it! I'd love to see it! 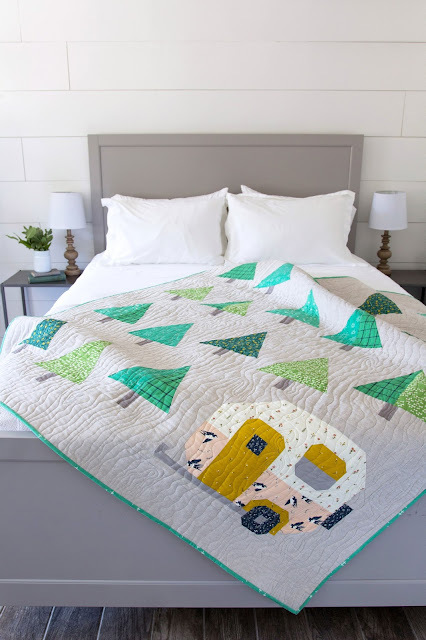 I am so excited to introduce my newest pattern to you guys - the Up North quilt! Originally I was going to make a multiple size block pattern for my Row by Row trailer (pattern for that HERE), but after spending quite a bit of time doing the math for one of the sizes, I realized the block had too many pieces for it to be realistically used in a bigger project - like a quilt! I wanted to simplify it, take out the paper pieced section and make it easier to sew overall. After adding some trees the idea quickly turned into the quilt below. I hope you guys like it! 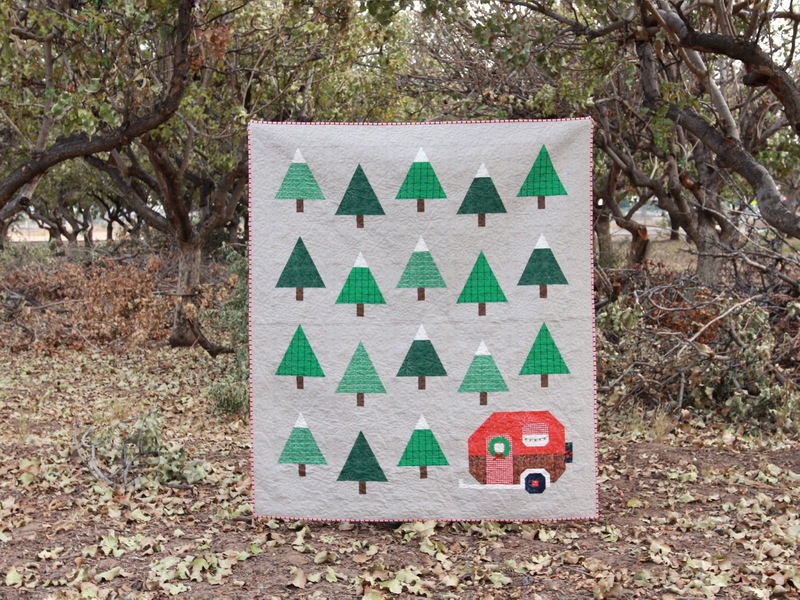 You can find my Up North quilt pattern HERE! I still have the block pattern for my Row by Row trailer available in my shop! 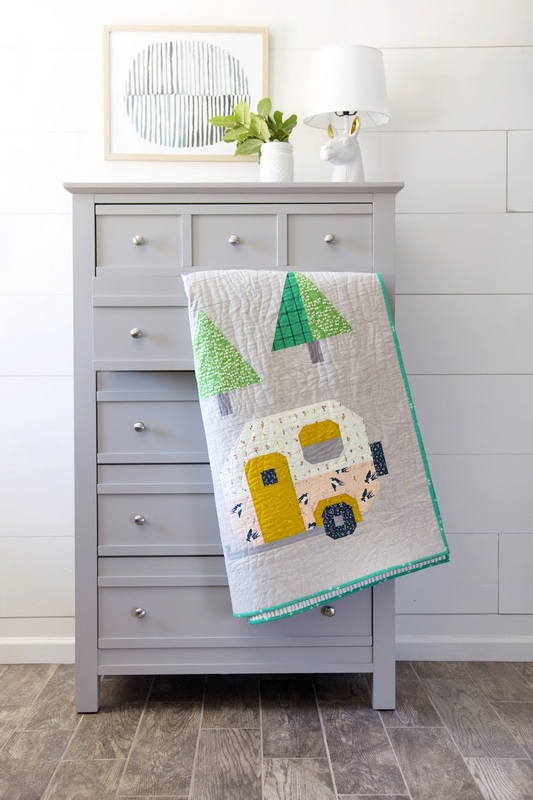 My Row by Row trailer is perfect for smaller projects like pillows, minis, trivets, and banners. 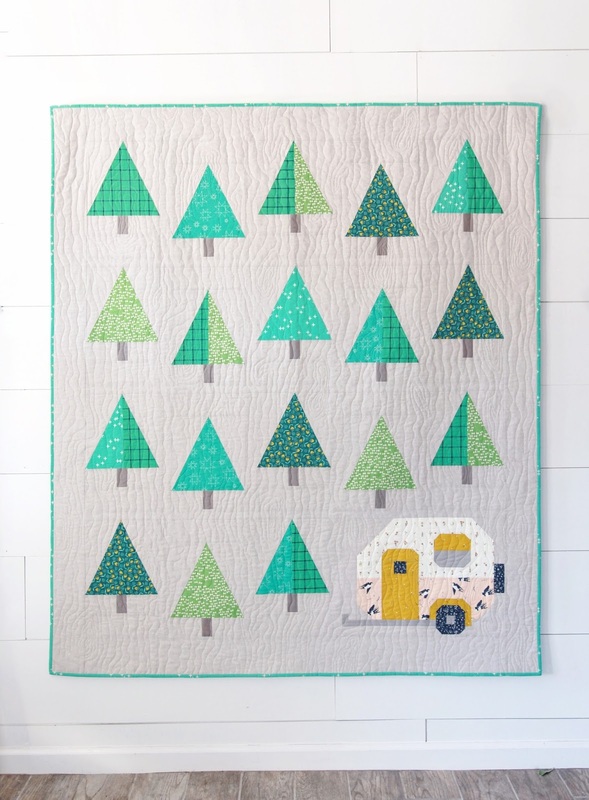 And the trailer in the Up North quilt (which measures 14 1/2" x 20" finished) is -obviously- great for quilts (or maybe a REALLY big pillow??). You could even take out the trees and make a quilt with just trailers on it. How cute would that be?? The original trailer pattern from Row by Row 2017! 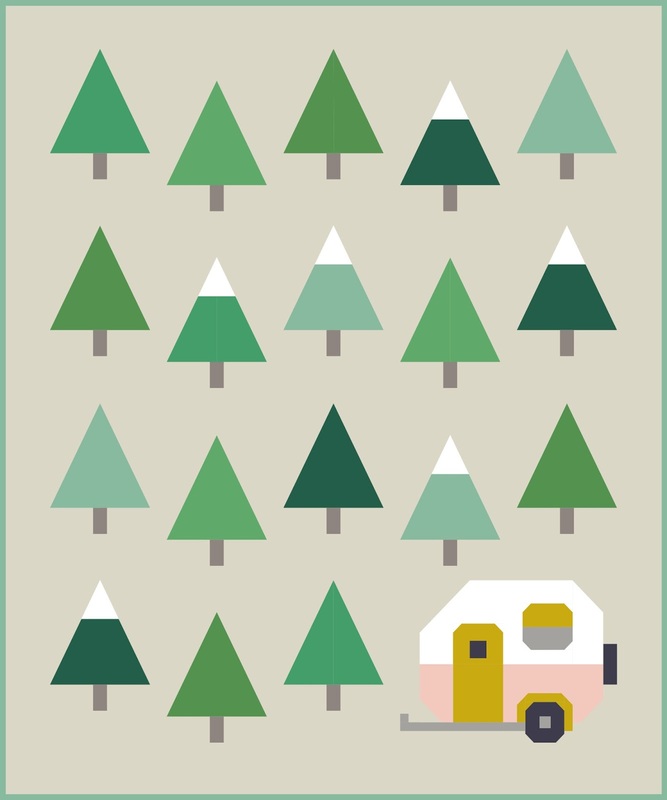 While designing the Up North quilt I was really torn between making some of the trees "50/50" (my 9am brain can't think of a better way to describe them haha) or having some of the trees be snow-capped instead. Ultimately I went with the 50/50 tree, but decided I would still give instructions for making the snow-capped trees too! Tutorial for them below! The first thing you'll want to do is determine how many trees you want to be snow-capped. In my example above, I made six of the 18 trees snow-capped. 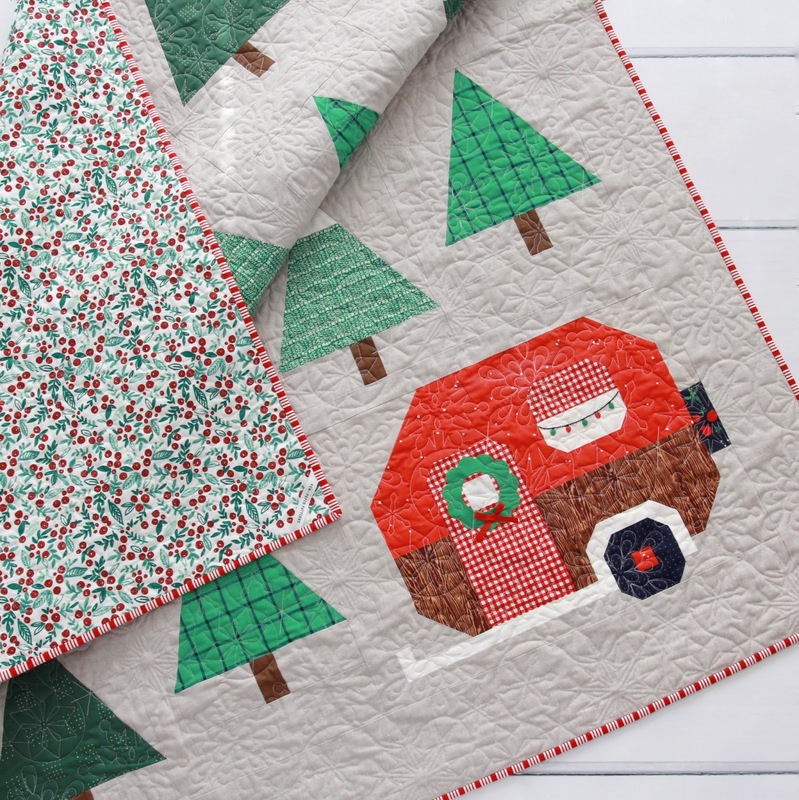 Next, for each snow-capped tree, you'll cut out a 6 3/4" x 9 1/2" piece from one of your tree fabrics and a 3 3/4" x 9 1/2" piece from your snow fabric. Using a 1/4" seam allowance, sew those two pieces right sides together (Figure A). 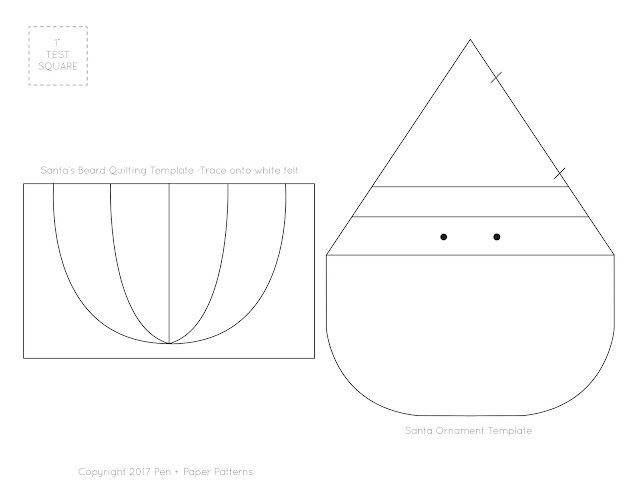 Using the tree template from the pattern and the unit from the previous step, cut out the tree shape (Figure B). Follow the remaining instructions in the pattern to finish the tree (Figure C). It's a super easy alternative to the tree block and gives the quilt a more wintery vibe too! 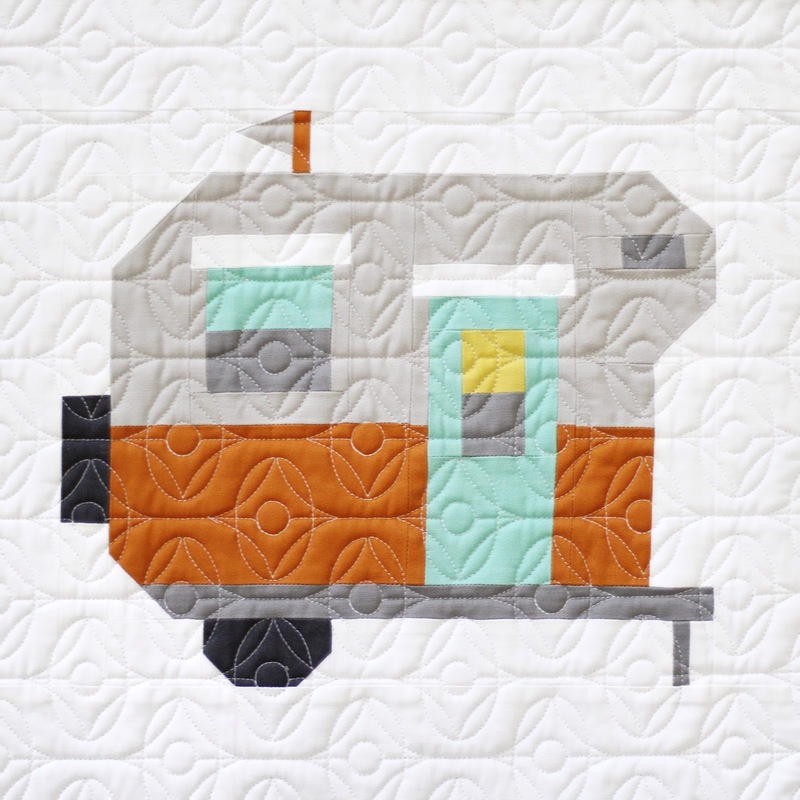 I really hope you all enjoy making the Travel Trailer block or the Up North quilt! If you have any questions or comments about the trailer patterns, you can comment below or email me at PenAndPaperPatterns@gmail.com! I find staying organized while making a quilt, especially a block-of-the-month quilt, so valuable to the quilt making process. 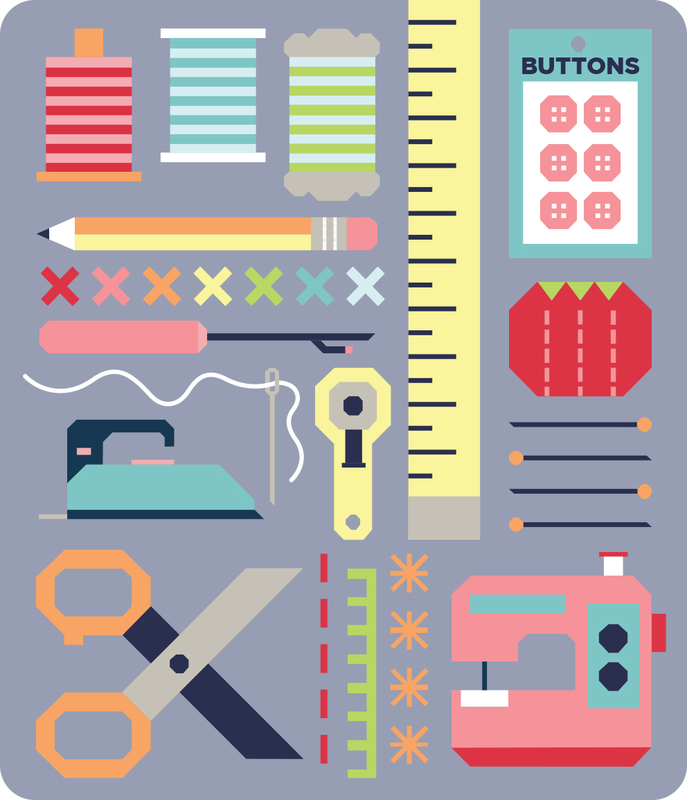 I know a lot of creative people who operate better with the clutter, but personally, I find it's just one more thing to become frustrated about while sewing later. I hope my fellow Type A's and aspiring Type A's find these suggestions helpful! 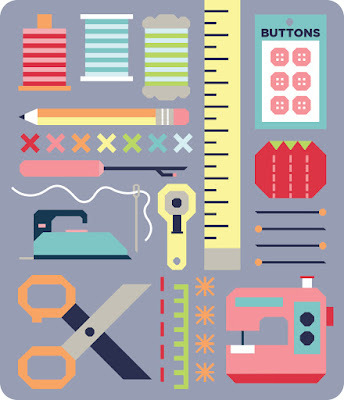 And if any of you have additional suggestions for staying organized during this sew along, please comment below. I'd love to hear them! - Printed copies of the front and back covers, introduction and all currently released block patterns. 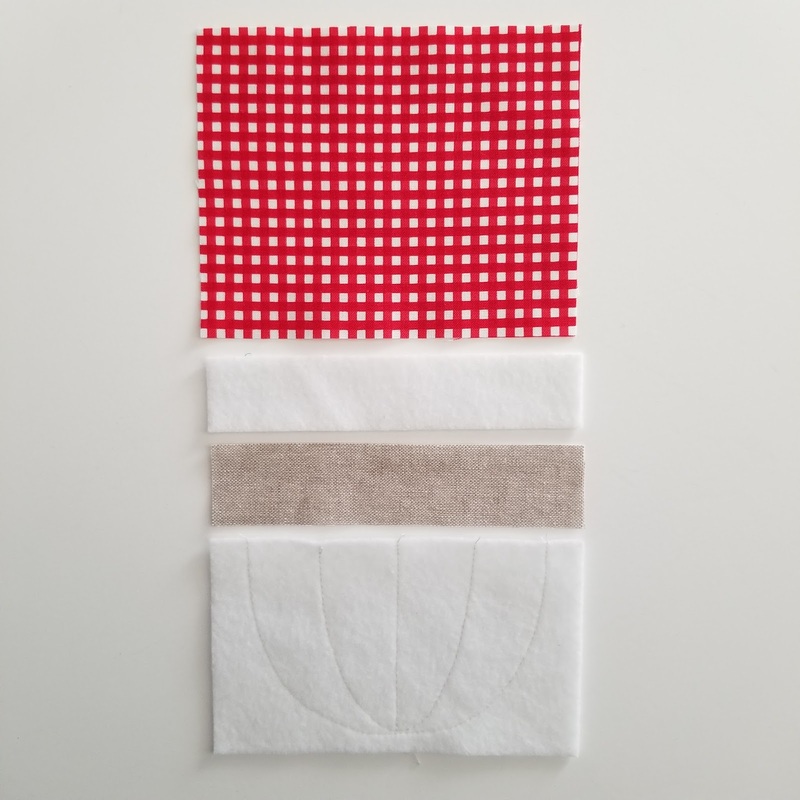 Below are instructions and some visuals for how to use the Binder Spine Label and Page Tabs when organizing your Sewology pattern! 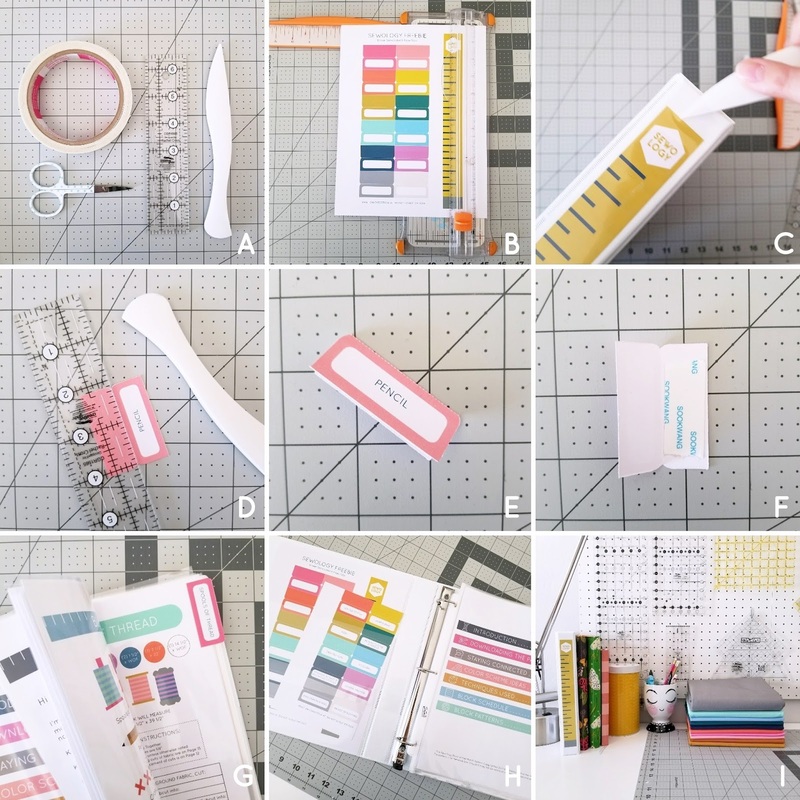 A - I recommend using double sided tape, a small ruler, Hera Marker, paper trimmer and small scissors for cutting out and applying the label and page tabs to the organized pattern. B - Using a paper trimmer or scissors, cut out the Binder Spine Label and Page Tabs. C - Carefully insert the Binder Spine Label in the clear sleeve pocket on the spine of the binder. You may find it helpful to use the pointy end of the Hera Marker to insert it further down into the sleeve. 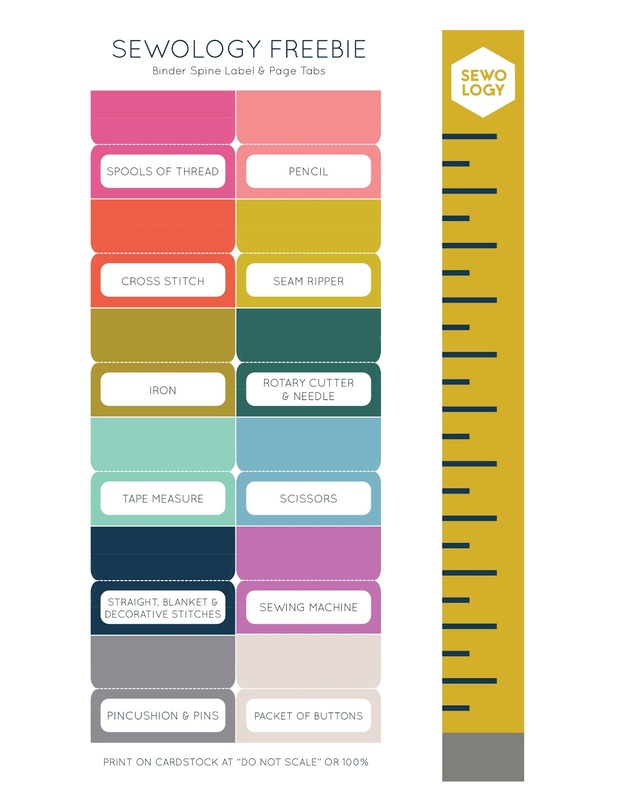 D - After you use the small scissors to trim the curved detail of the Page Tabs, take a ruler and the round, flat edge of the Hera mark and create a crease along the dashed line of the Page Tab. E - Fold the Page Tab in half along the crease. F - Apply double-sided tape to the inside of the Page Tab. G - Sandwich the front page of the corresponding block pattern in between the folded Page Tab. You can apply it to the right outer edge of the page like I did or along the top of the page too. Just note that if you adhere it along the top, you won't be able to remove the pages inside the page protector without removing the Page Tab first. H - Store your remaining Page Tabs in the inner pocket of your binder. I - Labeling the spine not only makes the binder prettier looking, but it also makes it much easier to locate the pattern when you're ready to sew your blocks. I've had some online and local quilt shops offer to make kits for some of the Sewology quilt samples in the pattern! Here is a list of where you can find them! 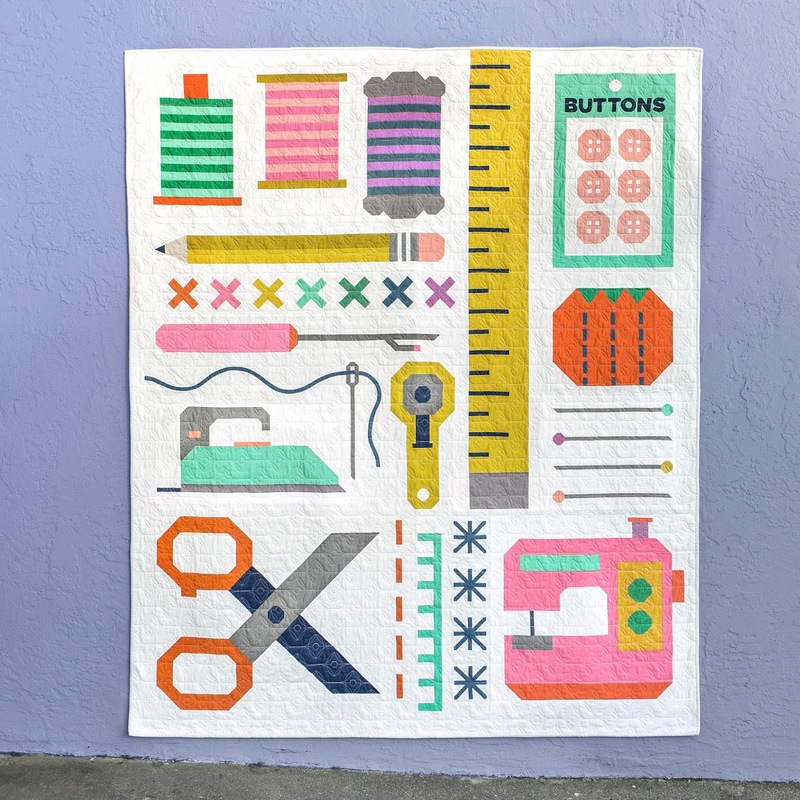 Handmade is Heartmade is offering kits for the Bonnie & Camille inspired Sewology quilt above! You can purchase this kit by sending them a direct message on Instagram with your PayPal email address. Fabric Bubb is offering a Kona solids version of the cover sample (original sample is made in Cloud 9 Cirrus Solids). You can purchase the kit for this version HERE. 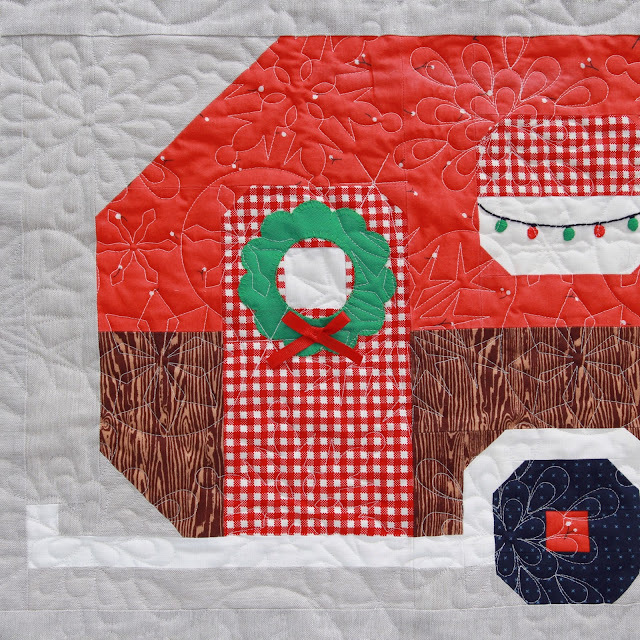 Quilted Thimble Cottage is selling kits for both the cover sample and the Bonnie & Camille version HERE! 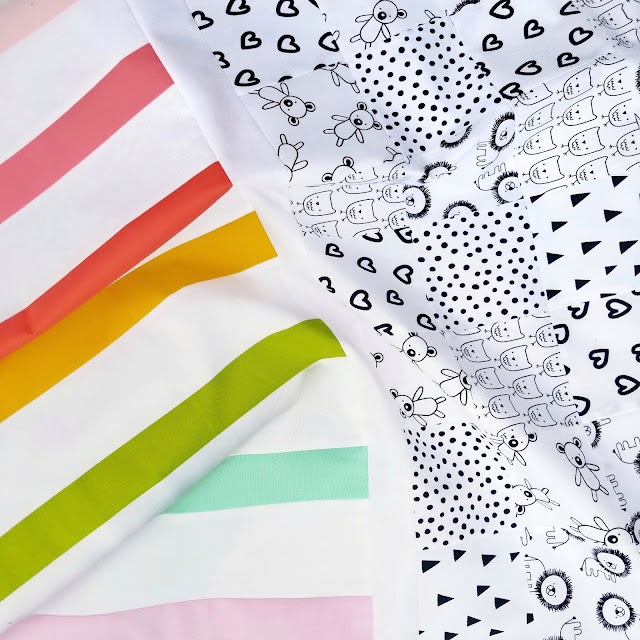 AND they're offering 10% off longarm services for finished Sewology quilt tops! 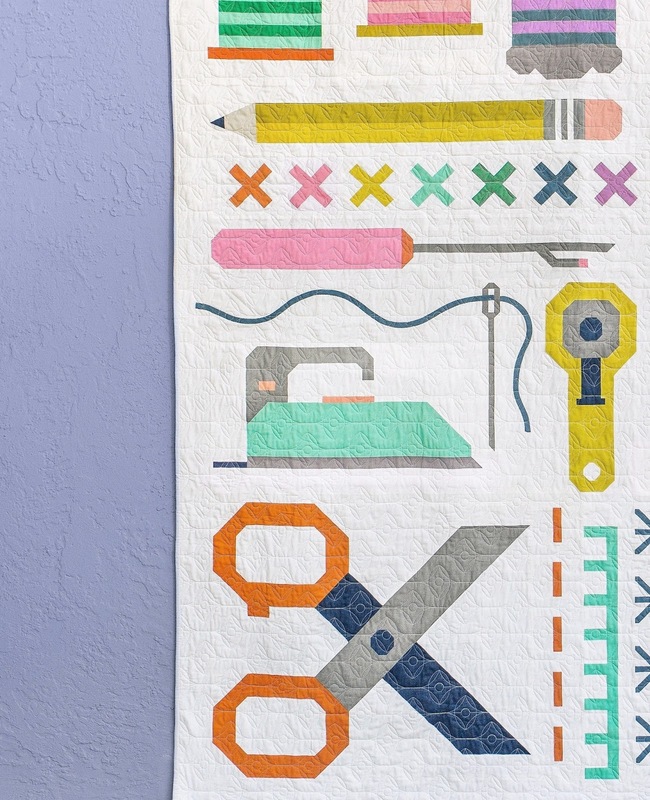 If you're a brick-and-mortar quilt shop, keep reading! Here's the plan - Local quilt shops can purchase the PDF pattern for a single fixed fee of $200 that will include the rights to sell and distribute up to 40 copies* of the pattern on a limited basis. I've written a Terms and Conditions document that outlines exactly what is and isn't included in the fee. You can download and review the document below. If still interested, you can then print and email me a photo or scanned image of the signed document to PenAndPaperPatterns@gmail.com. Shortly after I receive the email of the signed Terms and Conditions document, I will send you an invoice. Once the invoice has been paid, I will personally email you the block patterns as they are released on the 15th of every month from August 2017 - August 2018. *If you don't expect to sell 40 copies of the pattern (or maybe expect to sell more! ), I am willing to adjust the price accordingly. Please email me at PenAndPaperPatterns@gmail.com and we can work out a price that works best for you and your shop! I will update this list as the year goes on, but for now, here are the most frequently asked questions I've been getting about Sewology! 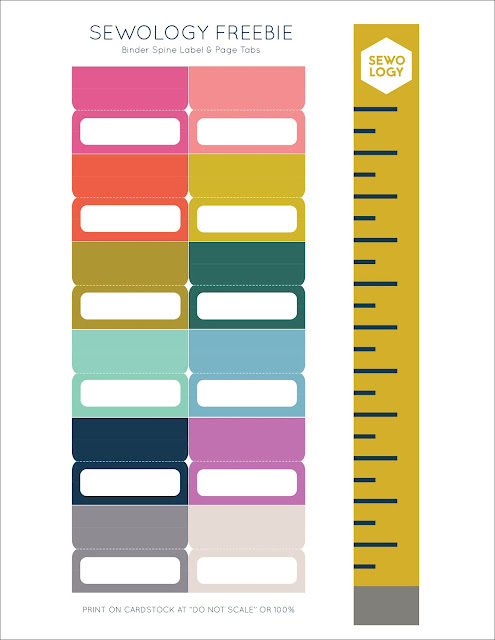 If you need me to expand on any of them or have a question that wasn't asked below, please feel free to email me at penandpaperpatterns@gmail.com! How do I purchase the pattern? August 15th, 2017 is the official launch date of the Sewology pattern! You will be able to purchase the PDF pattern, starting August 15th, through my Etsy shop [https://www.etsy.com/listing/623025020/sewology-block-of-the-month-pattern]. What will the cost of the pattern be? The cost for the entire pattern that includes the intro and all 12 block patterns as they are released during the year is $25. What is included with the pattern? 1. The techniques used in the quilt and instructions for how to execute them. 2. Five different color scheme ideas. As well as material requirements & fabric suggestions for each of them! 4. 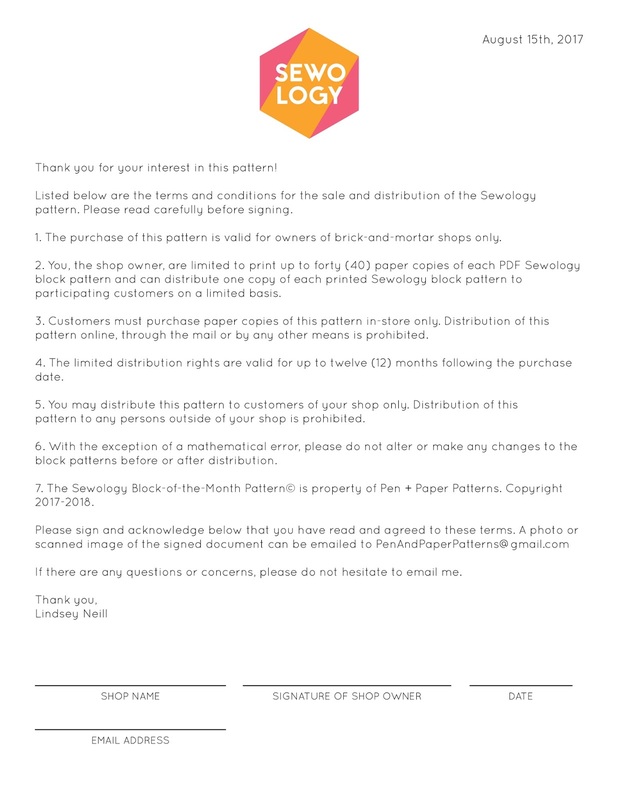 Detailed instructions for how-to download your PDF block patterns every month as well as a link for joining the Sewology Facebook group where you can share your progress and get advice from other Sewology members! 5. And, finally, a block schedule so you know exactly what months to expect each block. Is foundation paper piecing (FPP) used in this pattern? There is NO paper piecing in any of the blocks of this pattern! 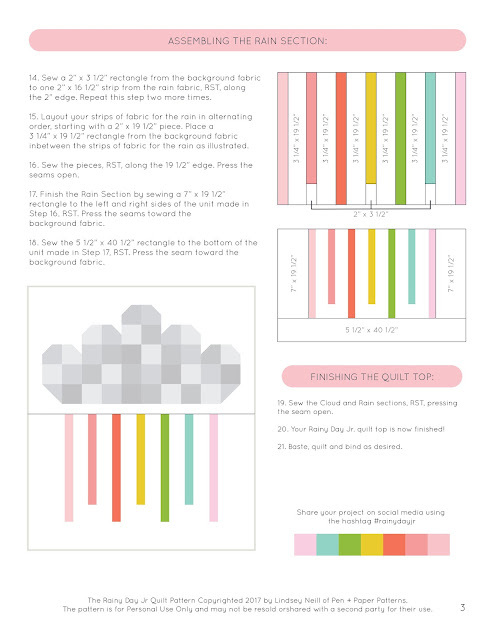 I know that will be good news to a lot of you 😉 There are other techniques used in the quilt such as - flying geese, half square triangles, raw edge and bias tape applique. 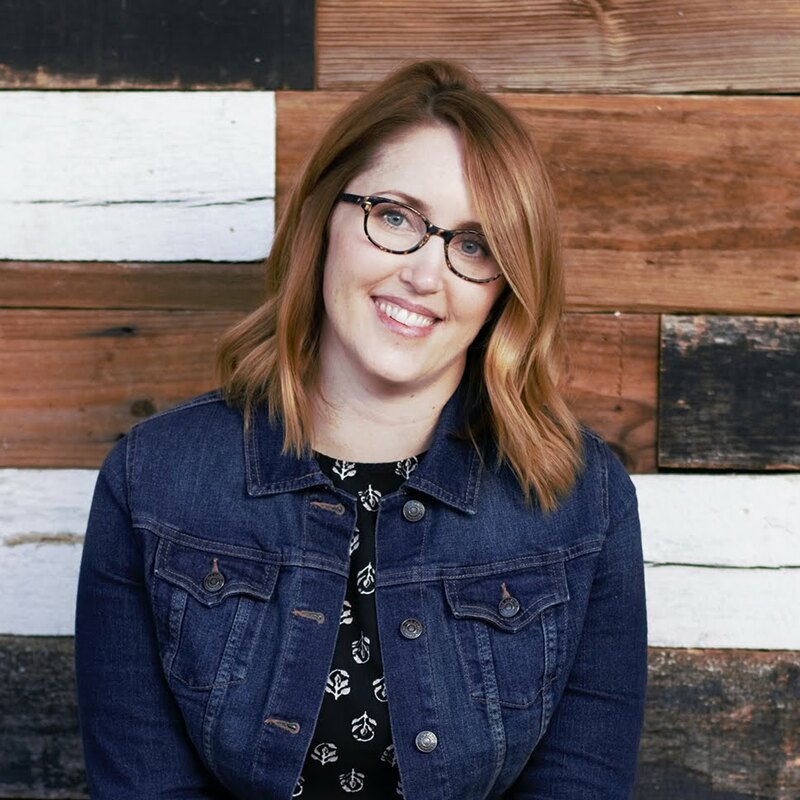 I go over each technique in the introduction and I will also be demonstrating the trickier techniques in a live broadcast from the Sewology Facebook group during the year! How big is the quilt? 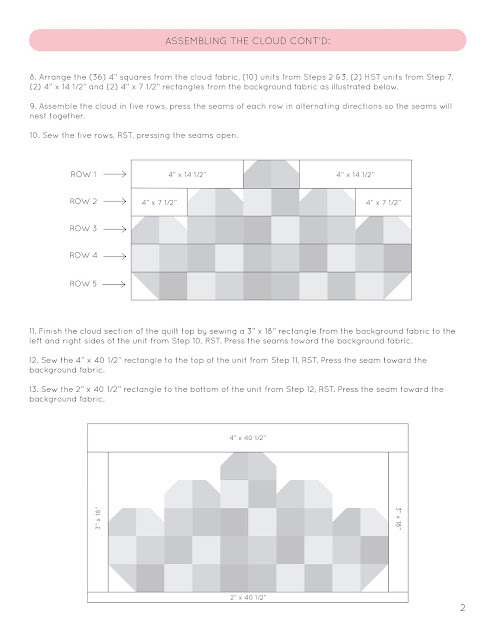 The Sewology quilt finishes 70 3/4" x 84 1/4"
What is the difficulty level of this quilt? 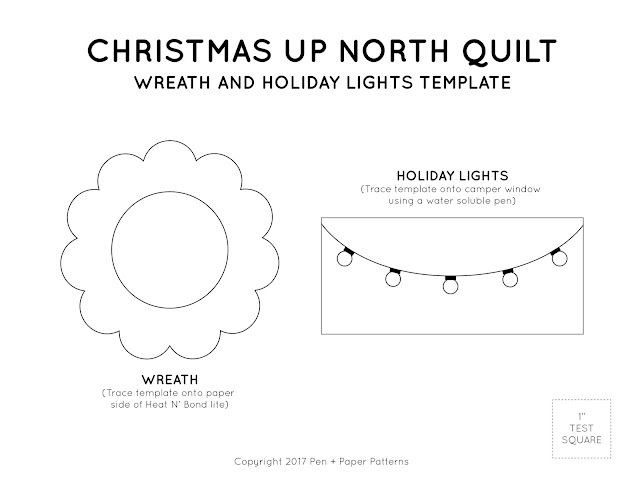 Can my local quilt shop participate in this sew along? Yes! More information regarding that can be found HERE. FREE Rainy Day Jr Quilt Pattern! 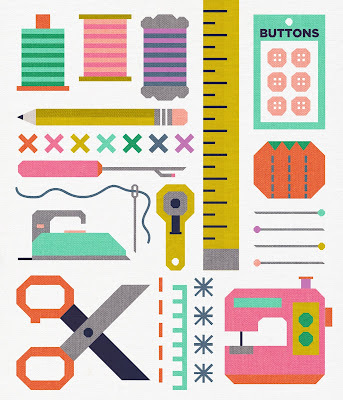 To celebrate, let's kick things off with a free pattern! Sound good? Here we go! BUT, I am so glad I went with my gut and made it anyway! Because, unlike usual, it turned out even cuter than how I pictured in my head. That never happens! 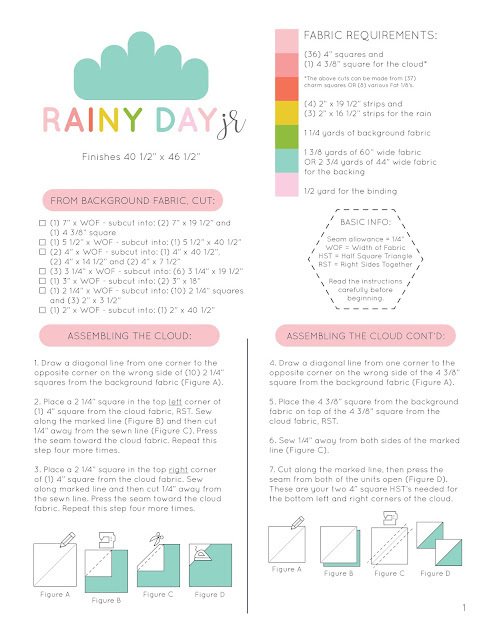 And, let's be real, there needed to be a beginner-friendly, no-curve version of my Rainy Day quilt anyway. 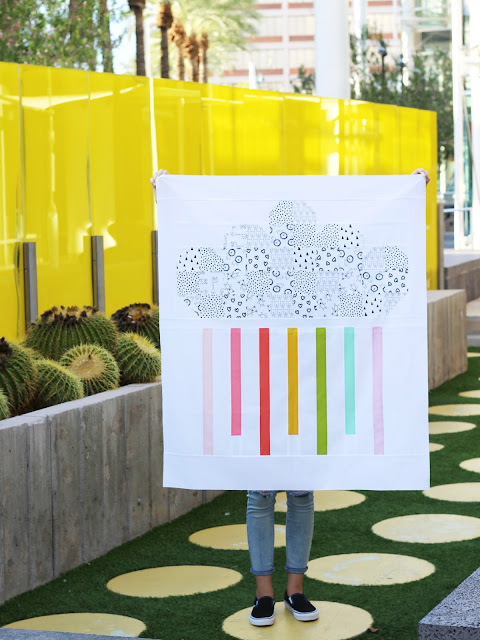 This quilt is SO QUICK to make. I think it was a total of 3 hours to make the top - cutting included! You can find the FREE (yay!) 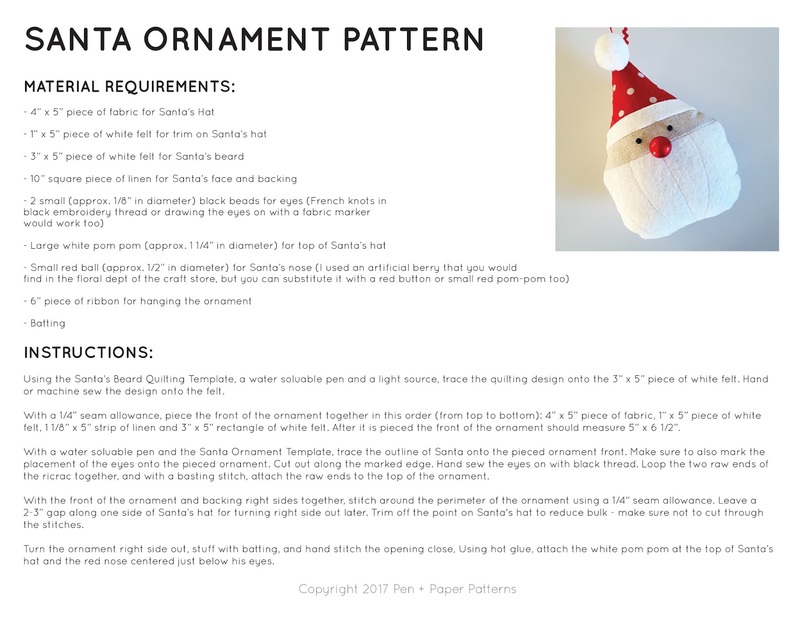 pattern by following the link HERE or downloading the pages below!